To continue our examination of lateral market trends in the South, we look at the Carolinas and Atlanta. Here is a look back at the Atlanta, Charlotte, and Raleigh markets for Q1 of 2015 and an overview of Q2 trends. You can connect with Scott or Erin on LinkedIn to receive regular updates on the market including un-posted jobs and helpful articles on associate compensation, career progression, and the soft skills needed to set you apart. According to reported data, approximately 14 lateral associate moves have been made in Atlanta, eight in Charlotte, and three in Raleigh. 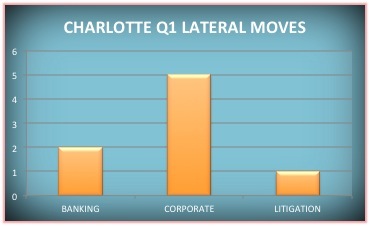 Corporate ruled the day in Charlotte while Atlanta saw a hiring spike in IP as well as Real Estate practices. Atlanta has approximately 65 associate openings with 35% of those needs falling under the Corporate practice area umbrella. 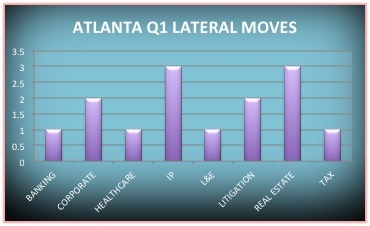 Other trending practice areas in Atlanta include IP, Real Estate, and Litigation. Charlotte presently has 32 associate openings. Of those openings, 25% are corporate associate positions. An additional 13% of the demand is for transactional associates with banking and finance sector expertise. 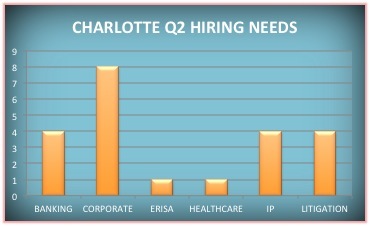 In addition to corporate and banking, IP is also an in demand practice area in Charlotte. Raleigh presently has 10 associate openings. Not surprisingly, 40% of those openings fall under the IP umbrella. 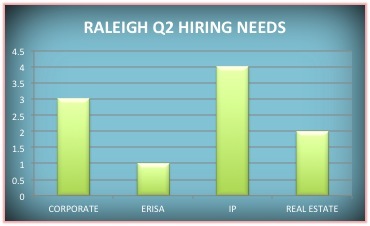 Secondary to IP, Corporate and Real Estate associates are in demand in Raleigh. Corporate practices continue to eclipse all other practice areas — particularly for mid-levels. 2014 was a banner year for IPOs, outperforming global indices by around 12.3% on average, totaling US$256.5b of capital raised. Projections for 2015 are muted slightly due market volatility but this is not estimated to have a seismic impact on investors. The lateral market will reflect this activity with a continued demand for Securities andCapital Markets associates. M&A will remain strong. While low interest rates were a major driver behind M&A deals in 2014, the increasing market volatility in 2015 should prompt companies to follow a multi-track strategy. A multi-track process is the course of action by which a company concurrently pursues a trade sale or a joint venture transaction and an IPO. A multi-track process is intended to provide the benefits of increased leverage, leading to a maximization of value; multiple exit options that provide insurance against unsuccessful sale attempts and volatile market conditions; and overlap in diligence materials, fostering efficient use of resources. According to research conducted by Ernst & Young for their Q4 Capital Confidence Barometer, 80% of companies are considering undertaking M&A activity in 2015. E&Y expects the use of global PE buyout dry powder, (which stood at US$468.1b at the end of November 2014—the highest level since 2008), to continue to fuel multi-track momentum. This will continue to drive the need for associates withM&A, Private Equity, and Joint Venture Fund experience. The consistent demand for Patent Associates in the Carolinas and Atlanta can be attributed to simple economics and location. Most patent associate positions require admission to the USPTO and an engineering or science degree. This drastically reduces the number of qualified candidates leaving us with a demand far greater than the supply. In addition, as the economy recovers, patent filings are increasing. According to the USPTO records, in the five-year period from 2009 to 2013, total patent filings went up by 21%. Next, combine these drivers with regions that are fertile ground for industry innovators. For example, North Carolina’s Research Triangle Park is a conglomeration of high-tech start-ups, Fortune 100 companies such as Cisco, Sony Ericsson and IBM as well as research institutions such as Duke University and NC State. Numerous top innovators call Atlanta home as well. Companies and institutions such as AT&T Inc., NCR Corp., Siemens Industry Inc., Georgia Tech, and AGCO Corp lead the way in patent filings in Georgia. All of this leads to the high demand for IP associates with specialized skill sets. Real estate, especially in Atlanta, surged back in 2014. The capital stack ratio of debt to cash/equity in 2012 was 60% debt/mezzanine to 40% cash/equity. Fast forward to 2014 and the ratio is 90% debt/mezzanine to 10% cash/equity. With the capital markets faucet turned wide open, deals are getting funded and shovels are in the dirt. This resurgence has lead to a demand for Real Estate Associates. Firms are seeking associates at all levels with both “dirt” real estate and commercial lending experience. Junior associates: With the way the market is heading, if you are a 2nd or 3rd year real estate associate, your marketability is on a trajectory. Mid-level associates: With so few associates entering into the real estate practice during the downturn, there is a shortage of associates at your level with your skill set. You will be in high demand as the market continues to gain momentum. Senior associates: Opportunities for senior attorneys still remain rare. If you have real estate finance experience, you are more likely to see law firm opportunities at the senior associate level. Prospects of making partner may begin to look brighter if the market continues its current trend. 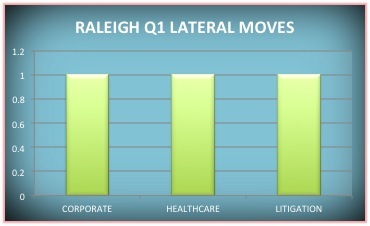 Litigation continues on a volatile trajectory showing increased demand in Q2. The numbers are still below recession peak levels, which has accounted for the competitiveness in the lateral market, but recent months have shown some positive signs. The energy market in Texas has increased demand for litigators with regulatory experience and IPO-related litigation will precipitate from a record year of IPO activity in 2014 continuing a need for securities litigation experience. In addition, increased cross-border transactions with Latin America have yielded mid to senior level international arbitration openings at top firms.